Explanation: This impressive color composite shows spiral galaxy M81 across the electromagnetic spectrum. 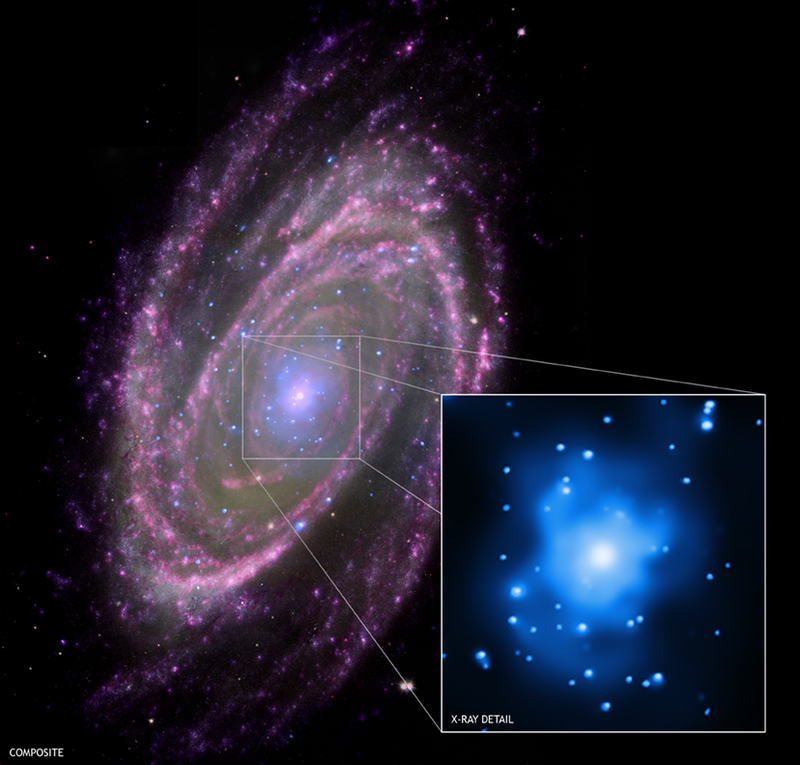 It combines X-ray data (blue) from the Chandra Observatory, infrared data (pink) from the Spitzer Space Telescope, and an ultraviolet image (purple) from the GALEX satellite, with a visible light (green) Hubble image. The inset highlights X-rays from some of M81's black holes, including black holes in binary star systems with about 10 times the mass of the sun, as well as the central, supermassive black hole of over 70 million solar masses. Comparing computer models of the giant black hole's energy output to the multiwavelength data suggests that feeding that monster is relatively simple -- energy and radiation is generated as material in the central region swirls inwards forming an accretion disk. In fact, the process otherwise appears to be just like the accretion process feeding M81's stellar mass black holes, even though the central black hole is millions of times more massive. M81 itself is about 70,000 light-years across and only 12 million light-years away in the northern constellation Ursa Major.